Recently, the late artist Ben Shahn’s Louis Kahn-designed house in New Jersey came on the market. The rich dual-legacy led me as far as the estate agent’s website, where a couple of dozen photos and the description of the house leaned heavily on the renovation by renowned woodworker George Nakashima. The house, while still sporting some vintage Kahn features – white, low-slung, a bit of nature embraced with the addition of two striking local-stone fireplaces – reveals its primary flaw right up front: it simply isn’t a warm place. Quite frankly, the Kahn portion of the house was rather unremarkable. I joked with a friend about how the interior was so devoid of character that Shahn had no choice but to bring in Nakashima to warm the place up (and this coming from a Kahn partisan). Besides the famous (and indeed extraordinary) Esherick House (1961), many don’t think of Kahn primarily as a residential architect. His remarkable architectural statements in La Jolla (The Salk Institute; 1959–65), New Haven (The Yale Center for British Art; 1969–74), and Dhaka (National Assembly Building; 1962–74), for example, speak to his masterful way with distilling large institutional ideas into the responsive, finely tuned buildings he became known for. It’s easy to forget that Modernist and Brutalist architects were once impressionable students and young architects themselves until you encounter their earliest works – often in the form of naïve or youthful travel sketches. Even to this fan of his bold mature work, the genuine sensitivity present in this small group of drawings and watercolours spanning the years 1928 to ’51 was revealing of Kahn’s deep-seated commitment to delicacy. To those unfamiliar with his body of institutional works (known mainly for their magnitude), or with his now-infamous triple life (picaresquely revealed in the feature-length documentary My Architect, 2003, made by his son Nathaniel), his philosophical and aesthetic steadiness and delicacy may come as a surprise. Kahn, the son of Latvian immigrants to Philadelphia, forewent a full scholarship to art school to attend the prestigious architecture programme at the University of Pennsylvania. Penn’s Beaux-Arts-style curriculum meant that the young Kahn – already considered a gifted artist as a teenager – was required to take more than 60 hours of freehand drawing and painting classes. Also included in the Beaux-Arts indoctrination was the appreciation for the classical form. It may not be immediately evident in much of Kahn’s work, or to the untrained eye, but Kahn was much more of a formalist than is usually recognized. Far from the lambasting Modernism that was coming into vogue in Europe in the ’50s, and slowly seeping into the American architectural conscience of the ’60s, Kahn’s touch could be understated and approachable, despite the monumentality of many of his buildings. This group of works on paper reveals a young student on a grand tour. They are not subtle, in their blush sepia-toned sentimentality. The watercolour Tower, Positano, Italy (1929) and sketch Trees and Hill/ Wall Gate, Ravello, Italy (1929) are positively paradigmatic Grand Tour sketchbook, but nonetheless strong architectural representations with a hint of warmth and a light touch. Later, the sketches and pastels of Italy and of Egypt, made while he was in residence at the American Academy in Rome (in 1950–51), manage to suggest a lasting influence on his mature architectural work. The thick, Guston-esque lines of the quarry piles in Aswan (Granite Quarries No. 5b, Aswan, Egypt and Granite Quarries No. 3, Aswan, Egypt, both 1951) could be concept sketches for his monolithic work in Ahmedabad. 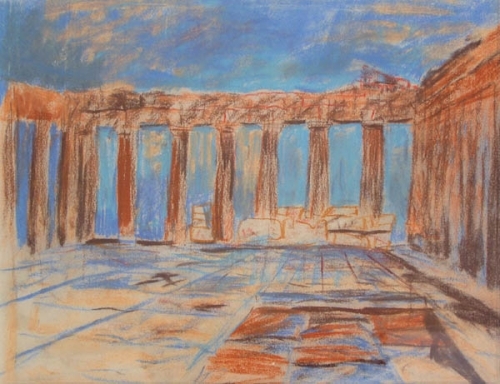 A visit to Athens produced a few requisite, though surprisingly multi-dimensional and colourful, pastels of the Acropolis (Propylaea, Acropolis, Athens, Greece and Interior, Parthenon, Acropolis, Athens, Greece, both 1951). In between, the mid-1930s are marked here by a North American tour from coastal Massachusetts to Nova Scotia, from where Kahn produced a few pictures, some almost child-like in their tone and colour – The White Church No. 3, Rockport, Massachusetts (1930–36) stands out as especially naïve. Moving up the coast into Canada, Kahn’s landscapes of Nova Scotia and Quebec’s Gaspé Peninsula were done the same year as Paul Strand’s studies of the local fishing communities and their architecture in and around Gaspé, though they emit a softer side of life on the rocky coast than the photographer ever elicited. Paul Strand once said of the painter John Marin (who had an architectural background himself) that he moved ‘toward an apocalyptic penetration of the spirit of place’. If, as represented here, Kahn’s works on paper are not so dramatically dark as Marin’s, they do confirm that his insight into the spirit of place, as evidenced in his massive institutional projects, was well established even as a young traveller.